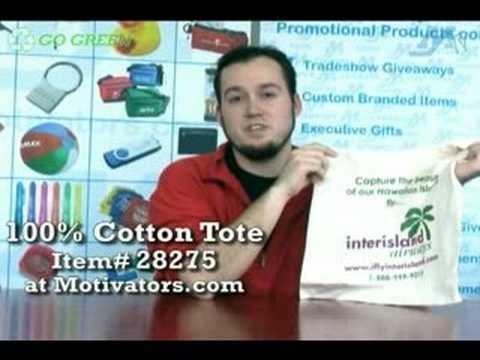 This convenient cotton tote comes in a variety of colors to perfectly compliment any company logo. This bag is a perfect trade show giveaway. With your bag being used to transport visitors' other trade show info, your logo will be on display the entire time. Customer Review: I love the product. Its sturdy and a good size. Customer Review: Light weight, soft cotton bag. The logo looks great! Customer Review: Very happy with it! Product Usage: Youth program, for youth to carry the supplies they need. Customer Review: The cotton material was a bit thinner than expected but the colors and artwork turned out great and the bag is perfect for the program we are using it for. Product Usage: Great service. Fast online ordering. Your graphics team was right on target with the graphics file. Customer Review: And the bags are great. 100 bags cost me the same as if I had ordered 20 from somewhere else. Testimonial: I do appreciate your exceptional customer service right out of the gate! You may have just gained 2-3 new customers with me due to my first call with you. It means a lot. Testimonial: We got our bags today! Thank you for the fast service! YOU GUYS ROCK!